This event is limited to 50 people. The lunch will include tours of the Johnson County Sheriff’s Office Criminalistics Laboratory and the Communications Center. The crime lab tour will involve seeing the layout of the lab and visiting the discipline-specific sections. The communications center tour will involve seeing the dispatch floor, which includes the Johnson County Sheriff’s Office dispatch and emergency dispatch. The Johnson County Sheriff’s Office Criminalistics Laboratory (JCSOCL) was established circa 1974. It was originally located in the Johnson County Northeast Offices in Mission, KS. March 2, 2012 marked the grand opening of the current laboratory building. This building has 62,500 square feet, which cost ~$30,200,00 to construct. This building houses eight distinct discipline-specific sections, which have a variety of environmental needs. In 2013, the JCSOCL achieved LEED platinum certification, which is the highest level awarded through the US Green Building Certification Institute. There are currently 41 employees housed at the crime lab. 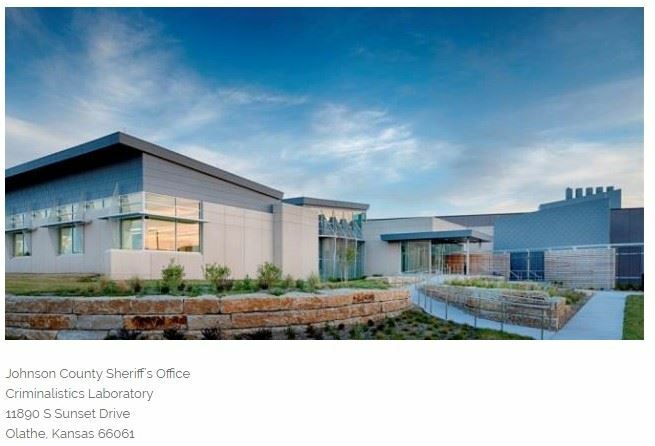 The lab provides criminal forensic services to the policing agencies and fire departments within Johnson County, KS at no expense to those agencies. Upon request, the lab also provides fee-based services to agencies outside of Johnson County.